WASHINGTON — As Virginia Democratic Gov. Ralph Northam resisted calls to resign over a racist photo that appeared under his name in his medical school year book, Lt. Gov. Justin Fairfax remains in the wings as the man who would replace him if Northam were to step down. Northam denied on Saturday that he was either person in a photograph that showed one person in blackface and another wearing a Ku Klux Klan robe. The governor said he had “darkened’ his face with shoe polish for a Michael Jackson costume in 1984, however. While Northam apologized and asked for forgiveness on Saturday, he also noted that he maintained a good relationship with Fairfax, who would be America’s fifth-ever black governor were he to take Northam’s place. 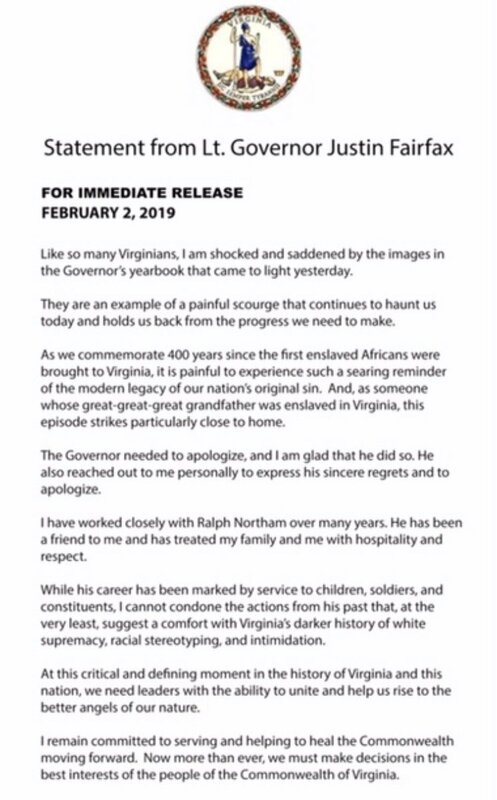 On Saturday, Fairfax released a statement saying he was “shocked and saddened” by the images that appeared in Northam’s yearbook. He added that the two have worked closely for many years. “He has been a friend to me and has treated my family and me with hospitality and respect,” Fairfax said. Fairfax said despite Northam’s career of service to American children, soldiers and constituents, he could not condone the governor’s actions from his past. “Now more than ever, we must make decisions in the best interests of the people of the Commonwealth of Virginia,” he concluded. Fairfax, 39, was only the second African-American elected statewide in Virginia when he won the post alongside Northam in 2017. The Duke and Columbia-educated lawyer has been a rising star in the party since making his first run for office 2013, after serving as a federal prosecutor in the high-profile Eastern District of Virginia. Fairfax lost that first campaign for attorney general in a Democratic primary, but he impressed party officials by coming closer than expected and easily won the primary for lieutenant governor four years later. Fairfax is a descendant of Virginia slaves and carried their manumission documents with him when he took the oath of office for the number-two job in Richmond, the capital of the former Confederacy. Still, Northam’s admission that he darkened his face with shoe polish for a costume in the past is not the only reminder that that process is incomplete. Just last month, the Virginia state Senate honored the birthday of Confederate General Robert E. Lee, as they do every year in Richmond, where the main avenue is still lined with giant Confederate monuments. “Mr. President” was absent, however. Fairfax, who in his role as lieutenant governor also serves as the president of the state Senate chamber and its only black member, had already left in protest. In that same role, Fairfax cast the tie-breaking vote last year to expand Medicaid in Virginia under the Affordable Care Act, which extended coverage to 400,000 low-income residents. Fairfax spent much of his childhood in Washington, D.C., where he lived for some time in a housing project with his grandfather after his parents divorced, according to his campaign biography. His wife is a dentist and they have two children. When former President Obama stumped for Virginia Democrats two years ago, he made special mention of Fairfax. “He didn’t grow up with much, but with scholarships, a hard-working mom, he went to college and law school and chose public service to make sure other striving young kids could have the same opportunities,” Obama said at the time. Only two black governors have ever been elected in the U.S. history, while two others were elevated or appointed to the position, including one during Reconstruction after the Civil War. Virginia only allows elected governors to serve a single, four-year term. But if Fairfax takes over the for three remaining years of Northam’s term, he would likely be able to run for a full term in 2021.